Life is full of paper. Most people save the important ones: birth certificates, driver's licenses, social security cards, report cards, marriage licenses and whatnot. Some folks save everything. I am one of them. In playbills, programs, scorecards and yearbooks, magazines, newspapers and comic books, I see an informal history of our time, things plucked from the on-rushing stream we call life. LISTEN. Starship Discovery has come unstuck in time. Blame it on a highly localized distortion in the space-time continuum, a Kerr Loop formed from superstring material, the slingshot effect or the Guardian of Forever. Call the Temporal Integrity Commission or just call it fate, the U.S.S. Discovery, NCC-1031*, took flight Sunday night, 40 years after it was designed by Ralph McQuarrie, the artistic visionary who gave Star Wars its retro-futuristic aesthetic. McQuarrie's concept was created for a never-made first Star Trek movie, variously titled Planet of Titans and Planet of the Titans. That project was scrapped in favor of a never-made TV series, Star Trek Phase II which later morphed into Star Trek: The Motion Picture. 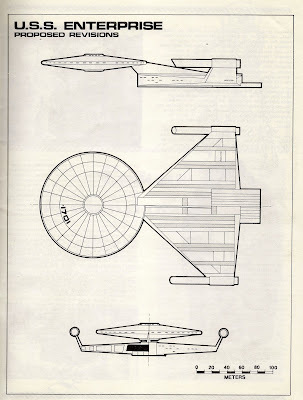 Thirty-nine years ago this month, McQuarrie's work on Star Wars, Star Trek and the original Battlestar Galactica were the subject of a feature article in uber-geeky Starlog magazine, but there his reimagined starship Enterprise seemed destined to remain. The project for which it had been commissioned, dead and gone. Starship Discovery's primordial ancestor, the McQuarrie-drawn Enterprise as seen in Starlog 17, October 1978. The next Enterprise we all saw was the instantly recognizable big-screen version of the original NCC-1701 (no bloody "A," "B," "C," or "D"), not McQuarrie's radical departure. Still fresh in mind, that triangular-hulled ship got a cursory hat tip in a 1979 fanzine celebrating the franchise's revival before fading from view. Or so it seemed. There's an ecological efficiency to the Trek universe, the ability to recapture and recycle concepts once they're made a part the canon and even when they're not. James T. Kirk got his middle name -- Tiberius -- from an animated series episode. Stories commissioned for Phase II were rewritten for The Next Generation. The Enterprise self-destruct sequence in ST III, The Search for Spock was first uttered in the TOS outing Let That Be Your Last Battlefield. Megalomaniac Khan Noonien Singh got his start back in 1967's Space Seed, returned in ST II, the Wrath of Khan and was sill menacing as of 2013's Star Trek Into Darkness. True to his name, Kahless the Unforgettable has not been forgotten. From his first appearance in 1969's The Savage Curtain, the Klingon Empire's progenitor remains a motivating force for Klingons in Star Trek Discovery. So it is that McQuarrie's starship finally got a series of its own after languishing in the shadows for years as a study model and spare part. 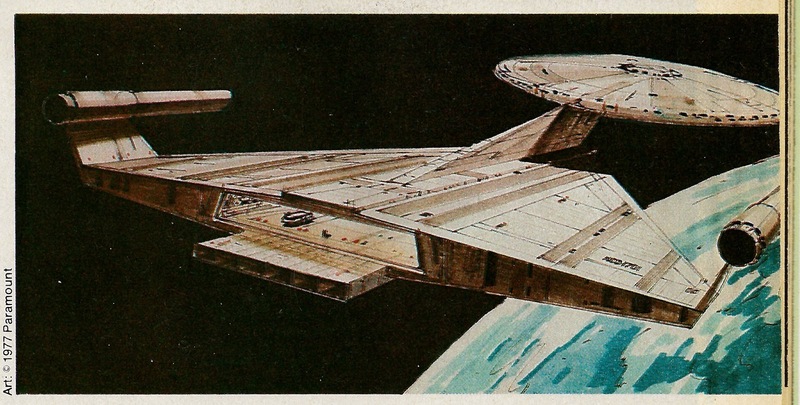 A space-faring Flying Dutchman, the McQuarrie mock-up drifted through the Trek universe for decades. 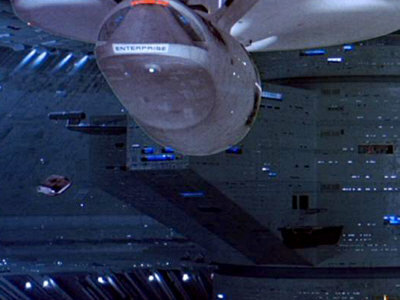 It was a dim shape hidden in the shadows of the vast space dock in 1984's Search for Spock. Six years later it was allegedly among those ships wrecked in the Battle of Wolf 359 in TNG"s Best of Both Worlds before appearing again in NextGen's Unification. Ralph McQuarrie's circa '77 sketch, published in Starlog, became the basis for last year's Discovery flight teaser. Then, 14 months ago, one of his illustrations came to life in a Discovery teaser video: an angular starship hidden within an asteroid that takes flight to a pulsating, hammering soundtrack. Its shape and its lineage were both unmistakeable and controversial. It was a Federation starship unlike any other and it was 39 years old. The video drew more than 2.3 million views and more than 4,600 comments, among them, "ugh," "hideous" and "USS Cheese Wedge." 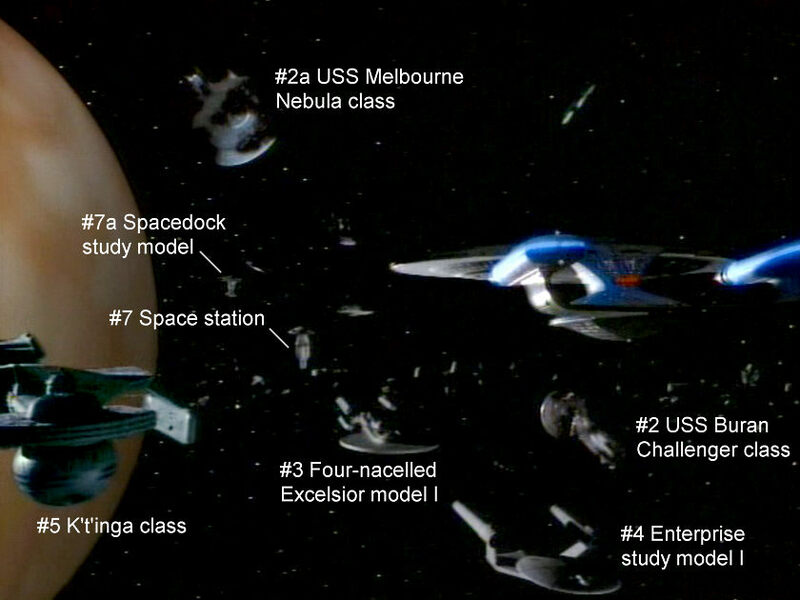 To be sure, McQuarrie's ship evolved over its four decades of phasing in and out of the Star Trek universe. 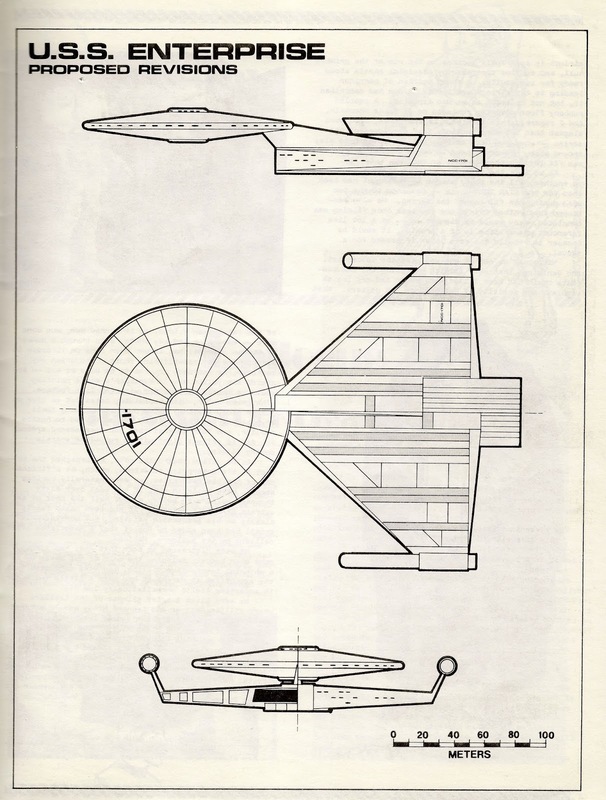 The original drawing featured a ship with small, cylindrical nacelles and a solid saucer section. The Discovery test flight version's saucer was ribbed, it's nacelles squared off. The ship as finally seen in episode three of the new series, Context is for Kings, features a never-before-seen saucer of concentric rings. It's not exactly Ralph McQuarrie's starship, but it's not your father's either. Sadly, the illustrator didn't live to see his vision come to life. He died in 2012 at the age of 82. 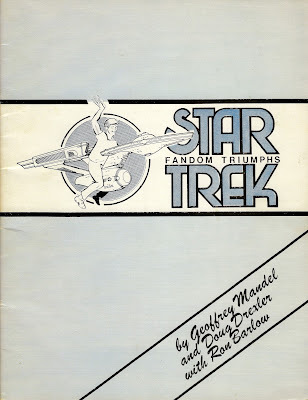 Last week in this space, I questioned the need for a new Star Trek series, what with six predecessors and 13 feature films. More Trek seemed, well, excessive. Still, I watched the broadcast debut, and then episodes two and three on CBS All Access. I confess, I'm hooked on its good, evolving story line. It's unlike any Star Trek outing before and that raises a some questions: is it true to Gene Roddenberry's vision? Is it Star Trek in name only? A colleague said Fox's send-up, The Orville, is a better Trek than Discovery. Not saying I'm not watching. I'm just not sure. Feel free to vent in the comments box below. * When this article first ran, I'd transposed the registry number as 1301. It is now correct. Miami Diary: When J-E-T-S Spells P.T.S.D. Copyright Andy Harris 2018. All rights reserved. Simple theme. Powered by Blogger.